The 1941 WPA Guide to the Minnesota Arrowhead Country describes Proctor, Minnesota, as “the greatest iron ore transportation center in the world.” The city then boasted the world’s largest railroad sorting yard—57 miles of track on 240 acres—which could hold nearly 6,500 rail cars. The rail yard—and hence, the town—owes its existence to the 1893 construction of the Duluth, Missabe & Northern Railroad. But the story of Proctor begins 40 years prior to the arrival of its first train, back when the Minnesota side of Lake Superior first opened to settlement of non-native people, and contains a series of serendipitous coincidences which resulted in the town taking its name not from its largely forgotten founder, but from a man who once famously ridiculed the Zenith City on the floor of Congress. In the summer of 1857, U.S. Vice President John C. Breckinridge visited Superior City, then the most populous non-native community at the Head of the Lakes. He was among a party of Kentucky aristocrats on a tour of land investments in Chicago, St. Paul, and Superior. Accompanying him were future U.S. senators James B. Beck and future Kentucky governor Beriah Magoffin, Jr. Magoffin’s 14-year-old son, Beriah Magoffin III—Proctor’s future founder—accompanied the group. The ties among these men went beyond their mutual real estate endeavors. Breckinridge and Magoffin Jr. met as students at Kentucky’s Centre College, and Breckinridge and Beck shared a law practice in Lexington. Breckinridge was one of the “Superior Proprietors,” a group of investors—including Douglas County namesake Senator Stephen A. Douglas of Illinois—that owned 4,000 acres in northwestern Wisconsin. The property was split into 27 shares; Breckinridge owned two shares and in 1854 sold a quarter of his stake to the elder Magoffin. The Magoffins ranked among the elite of Kentucky society. Magoffin Jr.’s maternal grandfather, Isaac Shelby, served as the state’s first governor. The family also had an adventurous streak. His sister, Susan Shelby Magoffin, was one of the first non-Native American women to travel the Santa Fe Trail from Missouri to Mexico in the 1840s. The party arrived in Superior City aboard the paddle steamer Lady Elgin and, according to Magoffin III, “stayed more than a month…, cruising and fishing and picknicking [sic] around and about the big harbor…and up the Saint Louis river.” John Townsend Trowbridge, writing in 1870 for the Atlantic Monthly, described Superior as “…the project of Breckinridge and his Southern associates, who got a [railroad] land-grant through Congress, and founded Superior City,…a Northern metropolis to which they could bring their servants in summer, and enjoy the cool breezes of the great lake.” For these Southern gentlemen, the future held limitless possibilities. Superior City was booming, Breckinridge had just become vice president, and Beck and Magoffin Jr. surely thought their political careers held similar promise. The idyllic and hopeful tone set in the summer of 1857 ended abruptly. The Panic of 1857—the first international economic depression—crippled Superior City. That winter the town’s population fell from 2,500 to just 500. In 1860 the Democratic Party split apart. Breckinridge and Douglas, friends and real estate partners, became rivals when their respective factions nominated both men as presidential candidates. This schism turned out to be a great help to the candidate of the upstart Republican Party, Abraham Lincoln, who happened to have married Breckinridge’s cousin Mary Todd. Lincoln’s election led to the outbreak of the Civil War. The economic crash had halted Superior City’s growth, and the war ended any further investments at the Head of the Lakes by southern gentlemen. The region came perilously close to extinction. The war cost those southern gentlemen more than just the promise of Superior—it cost them a transcontinental railroad. According to the Chicago Advance, “[When] the Northern Pacific Railway Company was chartered…, the leading spirits in the enterprise were Southern politicians and capitalists, John C. Breckinridge, Beriah Magoffin, and several other members of the Kentucky political ‘ring’ being among the projectors. Before the outbreak of the rebellion the franchise of the company passed over into Northern and loyal hands.” While the railroad slipped from their grasp, and Superior was all but dead, the Kentuckians still owned land along the St. Louis Bay ripe for use by a railroad seeking a harbor. The rivalry between Superior and Duluth was about to commence in earnest and one of its most famous chapters involved Proctor’s namesake. 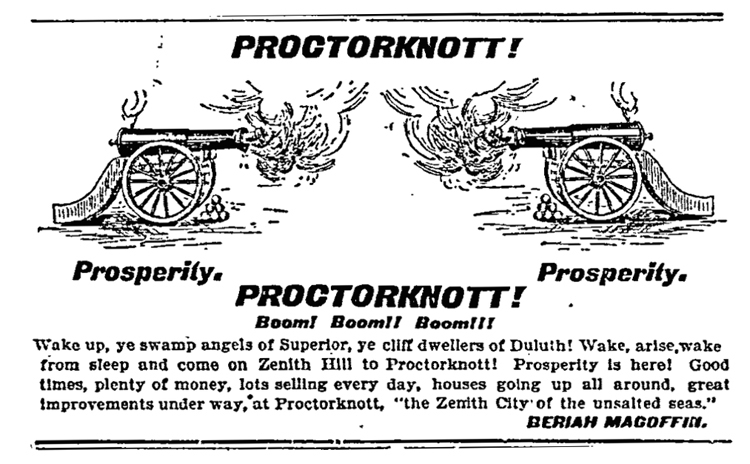 Postbellum, the main threat to Superior City’s prosperity sat right across the bay—the emerging community of Duluth, Minnesota. During the war the Lake Superior & Mississippi Railroad (LS&M), was incorporated by investors in St. Paul. The LS&M, which began construction in 1863 in St. Paul, was designed as a portage railway to connect the Twin Cities to the Head of the Lakes—essentially, as its name implies, from Lake Superior to the Mississippi River. The question was, where would the LS&M’s northern terminus be located—in Superior or Duluth? When the war ended the LS&M consisted of just 30 miles of graded roadbed. Track laying began at St. Paul early in 1867 but was quickly stopped when the original investors ran out of money. One of the road’s directors, William Banning, contacted Philadelphia banker Jay Cooke, America’s leading financier at that time. Fresh off of his success financing the Union’s war effort by selling bonds in Europe, Cooke took on his next project—construction of the Northern Pacific Railroad (NP)—with a sense of divine favor. Unlike the newly completed Pacific Railroad, the nation’s first transcontinental railroad, no public subsidies would pay for the construction of Cooke’s Northern Pacific, which was planned to stretch from the Head of the Lakes to Puget Sound. The graft involved in the completion of the first transcontinental weighed heavily on the scandal-ridden presidency of Ulysses S. Grant. Only the likes of Jay Cooke and Company, with its proven method of selling bonds, could attempt to finance the NP’s construction. Cooke’s investment in the NP would ultimately make Duluth—and not Superior—the largest American city on Lake Superior. It was the promise of further financing that determined where the railroad would begin and end. St. Paul ultimately outbid Minneapolis for the southern terminus, and St. Louis County—by a one-vote margin—came up with more money than Douglas County, which made Duluth the northern terminus. Because of this public financing, the LS&M’s land grant changed in 1867 to an all-Minnesota line. Investing in the LS&M and harbor facilities in Duluth—first an outer breakwater and dock, later a ship canal—was the swiftest means toward commencing construction of the NP. Meanwhile, the NP’s eastern terminus was established at Carlton, Minnesota. Superior investors tried to compete. The St. Paul Daily Press reported a gathering of Superior investors—including Magoffin Jr.—urging the purchase of subscriptions amounting to $300,000 (about $4.8 million today) to build a railway from Superior to Carlton called the Superior & State Line Railroad to divert traffic away from Duluth. The railroad was never built. But the Hudson-to-Superior line was no mere figment of Mitchell’s imagination. The Wisconsin Assembly passed an extension of the proposed road’s original 1856 land grant in February 1868. Meanwhile the LS&M began service between St. Paul and Duluth on August 1, 1870; the NP broke ground near Carlton the same year.